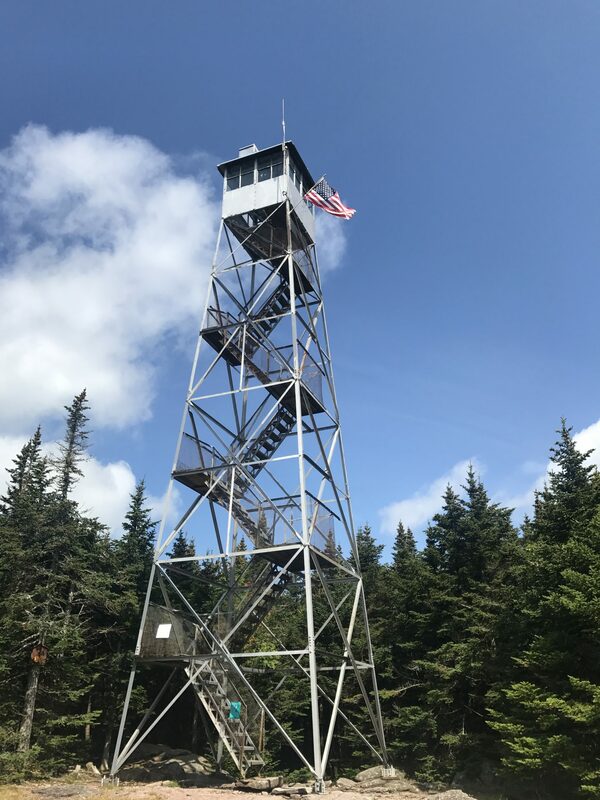 We woke up early Monday morning to head to Hunter Mountain to check out the views from the top and the famed fire tower on top of the mountain. 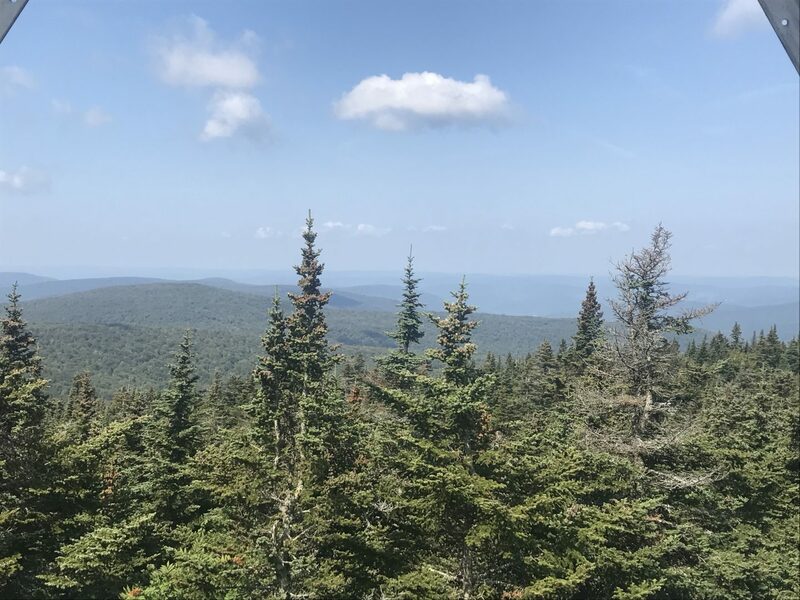 Hunter Mountain has an elevation gain of 1,898’ feet and is considered a moderate hike spanning 8.16 miles round trip. We found the first half of the hike to be fairly simple. For every sharp incline there was a patch of flat trail after it to walk it out. “This is pleasant!” we kept repeating to each other out loud over and over again. Then the last half of the climb started and THAT felt more like the harder mountain climbs we’ve done. Lots of steep inclines with no resting point until you made your own and just stopped for a few moments to catch your breath. It took us around 2-2.5 hours to reach the top. Once at the top we realized if we wanted to see anything but trees on top of the mountain, we would have to climb the fire tower. I’m not sure why this seemed so scary to us, maybe just because I wasn’t a huge fan of the gaps between each step where you could see how high up you were. Or maybe it was the wind that I swear I could feel the tower swaying in. “Seems silly, I’m not afraid to climb up stairs in my normal life, why are these any different?” I asked Krystal. 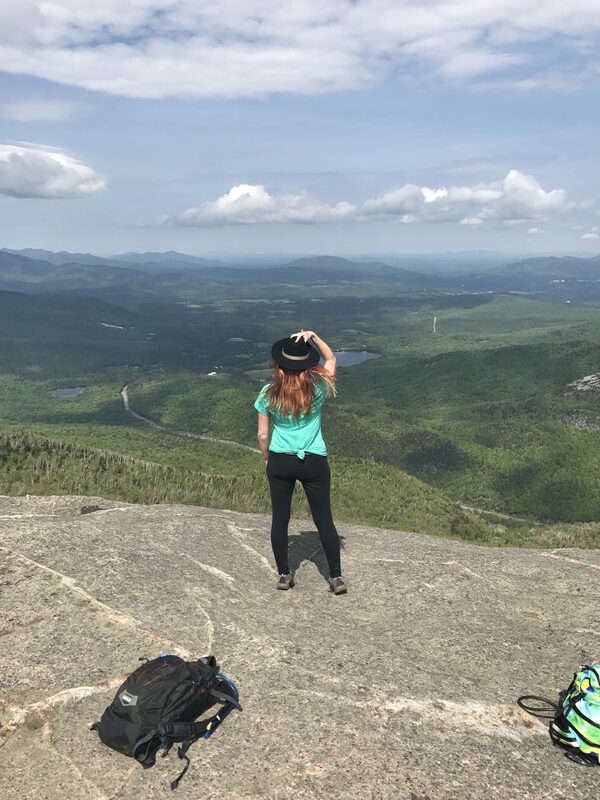 To which she explained her irrational fear that her legs would just “decide” (something legs so often do: make their own decisions) to catapult her off the stairs down to the bottom of the mountain. And I agreed this was a fear of mine too. And then we both agreed that we are very reasonable gals. Anyways, WE MADE IT. The views were once again, spectacular. The foliage was a really pretty shade of green this time of year, and combined with the super blue sky that day it really was something to see. So glad we trusted our legs enough to do this. The ranger followed us up the stairs and he was very nice and had a lot of knowledge to throw at us about the mountain and the region. He explained how he and his wife live in the cabin at the top of the mountain in one month intervals every few months. It was super interesting. Then came time to come down these scary stairs and hope our legs didn’t have any conspiracies against us. We asked the ranger if he would carry us down. He laughed because it probably sounded like a joke. And it was. Kind of. Before heading back down we visited the cabin where the ranger’s wife was there to talk to us about cabin living on top of a mountain. Truly fascinating. After spending a few minutes there it was time to head back down the mountain, which seemed much quicker than the way up and get in the car to start our drive back to Buffalo. Solid, solid weekend in the Catskills. How awesome that you had a chance meeting with the ranger. So cool! Another hike to add to my list of “must do” in the catskills. Hey every time I try to run a marathon my legs decide not to. Pictures are awesome and it’s really neat that you saw the ranger’s cabin and got to talk to his wife……neat. I enjoyed your description of climbing up the tower. It is little things like that that make the trips interesting. Would have enjoyed hearing a bit about what the ranger said about living on the mountain.